Just before I turned 30 in 2017, I wrote a post in which I explained how I managed to live, study and work in so many different places, but in this post I will focus on what I learned from this crazy experience. On this journey around the world, I also picked up ten languages – of which most, I can speak quite fluently. This gave me some interesting insights of the world that I will share with you today. 1. You don’t need talent to learn many languages. 2. Learning many languages does change your perspective on the world. 3. The world isn’t as dangerous as they say. 5. Globalization is unstoppable, accept it. 6. People choose stability over happiness. 7. Traveling doesn’t solve your problems. 8. Religion isn’t good or bad. 9. Freedom is more important than money. 10. There is always a solution. At highschool we all had to learn English as a foreign language. I was one of the worst students of our class. I still remember how after an oral English exam, my teacher advised me to never choose a career that involved foreign languages. At college, my teachers were very worried about my level of English. One of my teachers said that her 80 year old grandma spoke better English than me. Everyone was concerned about my ability to learn foreign languages, until I went abroad and changed my approach. During my second year at college, I did an exchange programme in China. We had to learn Chinese. Although I wasn’t one of the best students, I picked up Chinese quickly. This was only because of one reason – I loved being in China and being able to communicate with the people. When I learned something new, I tried it out with Chinese people I met. At school, I had to learn lots of words and grammar rules to pass my exams. In China, I was learning to communicate with Chinese people to make my life in China easier and more fun! For the first time ever I was passionate to learn a new language and I found a method that worked! My English and German got much better in the following years. Later, I also learned Spanish, Portuguese, Cantonese, French and even some Russian and Italian. These days I work with some of the most accomplished ‘’polyglots’’ and many of them were not good at languages at a younger age. The key is to be motivated, develop a passion for the language and eventually, getting a lot of practice. Enjoying the learning process using a method that works for you is much more important than being talented. Is it impossible to learn a language like Chinese? With the right motivation and a lot of practice, you will eventually get there. My stay in China changed me as a person. I’m from a small town in the south of the Netherlands and I’d lived there all my life. I thought that my town was all there was until I was 21 years old. Spending time abroad makes you realize that there is so much else out there in the world. You discover that the little world you’ve always lived in is very limited. Being able to talk to locals from all over the world in their own language changes your perspective even more. Speaking a foreign language is so much more than communication. It gives you the ability to experience another culture like a local. It’s like becoming a member of a new club. People trust you more, respect you more if you speak their language. They tell you things they would otherwise never tell you. It helps you to see the bigger picture. Speak the local language and live like a local, even if it’s only for a few days. You will be surprised what cultural insights you get. Photo: somewhere in the countryside in the south of China. When we went on a trip to Bucharest, Romania, people there asked us where we were going next. I said “we’re going to Moldova tomorrow’’. “Moldova? Watch out, it’s very dangerous there’’. In Moldova they asked us the same question. “We’re going to Transnistria next’’. “Why do want to go there? It’s a dangerous place.” In Transnistria they told us that Ukraine is even more dangerous. The reality is, people are afraid of the unknown. If you watch the news, it looks like the rest of the world is a miserable place to live in. One terrorist attack in Egypt doesn’t mean that the whole country is unsafe. I visited Syria in April 2014 while there as an ongoing war. I had a very peaceful holiday and met lots of friendly people. We had a great time. I’ve never felt safer anywhere than in North Korea and I’ve never met people more warm-hearted than in Iran. The problem is that most people have no idea what the real world is like. They have never been there, they don’t know anyone who lives there. Often, only the bad news gets the most attention. The good old days in Aleppo, Syria in 2014. Huge parts of this city were destroyed in the following years. When I arrived in China in 2009 as a student, I felt rich despite only having a scholarship of 350 EUR per month. All of a sudden, I could afford to eat in restaurants three times per day and take taxis instead of the bus. I felt as if I made it because I was comparing myself with local students. I do have a friend who runs a successful trade business which he built from scratch and he has made millions. He says that living in a big city in China makes him feel poor. He compares himself with the people he spends the most time with; other successful businessmen. There are billionaires out there who fly to private islands on their own private jets. There are always bigger fish. Everything is relative. Being poor in the Netherlands means that you’re rich from the perspective of someone who lives in the slums of Delhi. Don’t compare yourself with others, they’re in another game. Appreciate what you have but make sure that you have goals, work towards them and enjoy the journey. Countries used to be unique and authentic but these days they’re becoming more and more similar. Just travel to the other side of the world and soon enough you will see things that you also have in your country; Walmart, Starbucks, McDonald’s, Italian restaurants, German cars, Louis Vuitton, iPhones. Even Kim Jong-un, the North Korean dictator uses a Macbook. Small local businesses are suffering from this phenomenon and it’s not just that the big brands are taking over the local brands but major cultures are replacing smaller cultures. As many as half of the world’s 7,000 languages are expected to be extinct by the end of this century. Globalization is everywhere and is making the world less diverse. For many people, this is a sad thing. Others see this as an opportunity. Which side are you on? At school we’ve all learned to study hard, go to university, find a good job, get married, have kids and eventually tell them to do the same. Most people don’t break this pattern because that’s not what other people expect them to do. As long as you follow the rules of society, you will most likely have a stable, OK life. At least in a developed nation. Traveling abroad forced me to spend time with people from all kinds of different backgrounds. I discovered that the people who I envied the most, were those who lived their lives on their own terms. These were the people who were following their passion; traveling, languages, trade, cars, food, public speaking, art. All these people had unique skills and being able to break out of the traditional pattern is what enabled them to learn all these skills. In my early twenties, I learned that if I really wanted to live life to the fullest I needed to do what I really wanted to do. Not necessarily what others expected me to do. We all want to be happy and I believe that your level of freedom greatly affects your happiness. In order to get freedom, you need to escape the rat race which is something very few people dare to do. Most people go for stability. That’s OK but remember, you’re paying a high price. Do people in North Korea choose stability over happiness? Or maybe they don’t choose at all. For the point in which I mentioned that you need to follow your passion if you want to be happy, watch out! Just doing what you like to do can be dangerous. Many people like to travel, but many also use it as an escape from their problems back home. I know this from experience. Traveling around the world for a year is cool, but when you get back home, you will soon find out that everything is still the same. You’ve had a good time and you have all these beautiful pictures but now what? When you’re back home after a long trip, you’ve probably got less money in your bank account and your problems are still there, waiting for you. Going on a holiday for a few weeks is a good way to relax and refresh your mind. If you want to travel for a year, think about how you can turn this trip into an investment in yourself. Maybe you can start a popular blog or a YouTube channel, write a book, look for business opportunities, learn a new language or set up a global network. I used the time when I was traveling to network with people all over the world, learn languages and build LanguageBoost. If you spend your time traveling wisely, you can actually solve some of your problems. Traveling to countries like Mauritania just for fun won’t solve your problems at home. If you are religious you’re probably not going to agree with me on this one and that’s OK. The first time I spent a lot of time thinking about religion was when I went to Indonesia as an exchange student. Indonesia is the biggest muslim country in the world. Curious students approached me all day long at the university. They all had the same questions; “what’s your name?’’, “where are you from?’’ and “what is your religion?’’. Apparently, religion was very important for them and it made me think. If you’re born and raised in a traditional Islamic Indonesian family, it’s hard to imagine there is something else. On top of that, if you tell your family that you want to give up on your religion, you might lose your family’s support. Believing what you’re expected to believe keeps your life stable. Most religious people are sure they’re right, but that’s impossible as most religions contradict each other. I’ve never been a religious person but the more I learned about religion, the less religious I became. This doesn’t mean that religion is bad. Religion gives people hope, trust, purpose, motivation, support and it brings comfort. It can also create hate, violence, extremism, and inequality. Religion itself can’t be good or bad, the person who practices it can. Would you like to have more money? Yes, of course, right? Now the next question is; what are you going to do with that money? Most people think that earning more money is the solution to their problems. Although it’s true that having more money can solve problems, it can also create them. Think about the things in life that really make you happy like having the freedom to spend more time with your family and friends. Having the freedom to choose who you work with, or the freedom to go wherever you want and speak the local language. Money itself is a tool to create the life you want, it’s not the end goal itself. 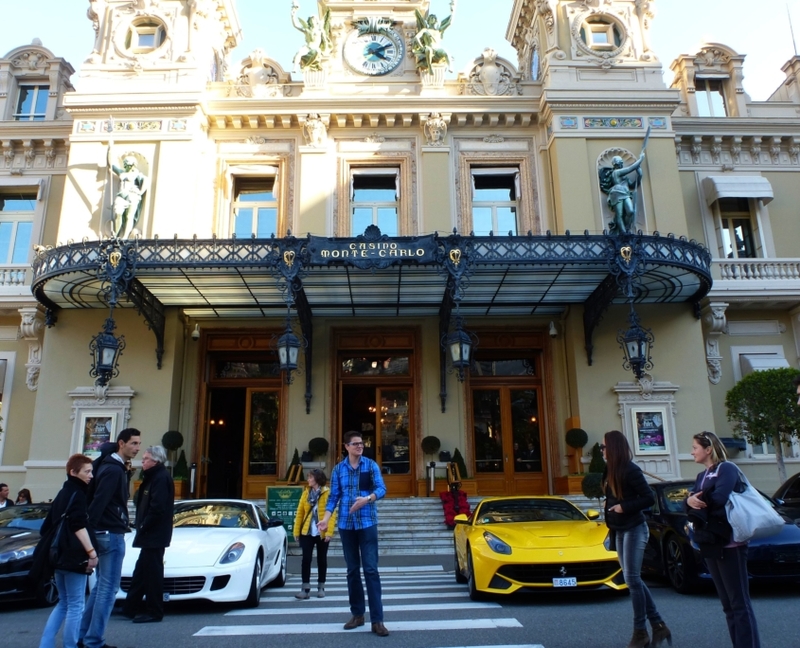 Money isn’t the end goal, even not in Monaco. Traveling made me a creative problem solver. I’ve been stuck between two African borders. I’ve also been lost in the middle of the night in Tokyo without any money. Every time I had to find creative solutions. Recently, I wanted to bring my 1-year-old son to daycare here in Brussels but it was raining. I decided to take the tram which I rarely do. We were getting wet and just when I arrived at the platform the tram arrived. I hadn’t time to buy a ticket but I decided to get on the tram anyway, I didn’t want us to catch a cold. It was only three stops until our destination. At the first stop, tickets were being checked and I was caught. The fine? 107 euros! How could I solve that problem? Well, I had to pay the fine, there wasn’t really any other solution. But thanks to this event, I have a nice story to share with you guys here in this post. Traveling the world will force you to come to that conclusion yourself, if you survive it of course! Jan van der Aa traveled to over 100 countries and learned 10 languages before he turned 30. On this website he shares his language learning experience and helps people from all over the world to learn languages faster.